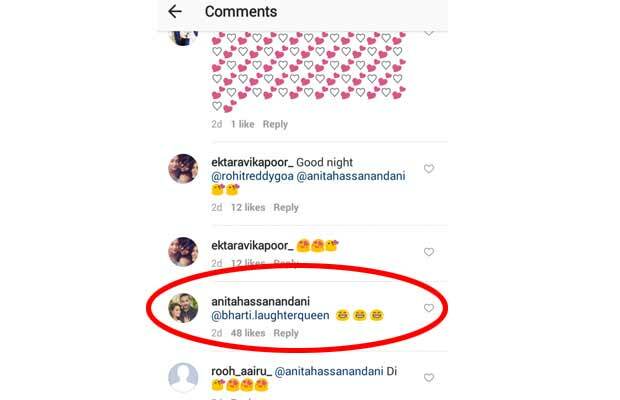 You Can’t Miss Bharti Singh’s HILARIOUS Comment On Anita Hassanandani’s Romantic Photo With Hubby! Television actress Anita Hassanandani shares the cutest pic ever on social media with hubby Rohit Reddy. Bharti Singh makes fun of it with a hilarious comment. Television actress Anita Hassanandani, who is popularly known for her role as Shagun in Yeh Hai Mohabbatein, recently shared an adorable picture of her with husband Rohit Reddy. Anita is quite active on social media and keeps sharing her cute pictures with hubby. However, the timing of sharing the picture went wrong this time. On the occasion of Raksha Bandhan recently, Anita shared an adorable romantic picture with Rohit on her Instagram. Guess what? Bharti Singh had a hilarious reaction to the adorable photo that will leave you splits into laughter. 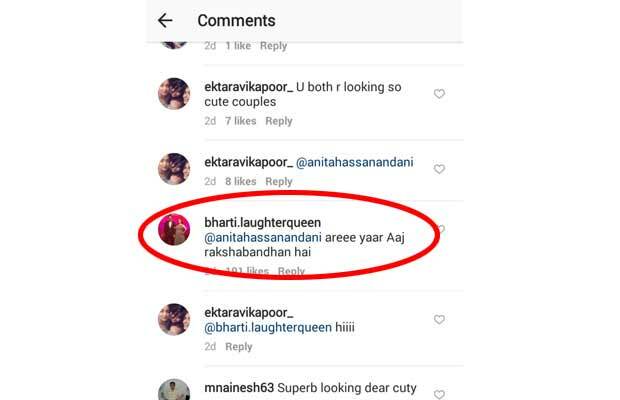 Bharti Singh commented on the photo, “areee yaar Aaj rakshabandhan hai” After which, Anita sportingly replied back to Bharti with laughing emoticons. Anita Hassanandani and Rohit Reddy got married to each other 4 years ago and are crazily and madly in love. They are one of the most endearing couples in the television industry. Previous articleInder Kumar’s Wife Pallavi REVEALS What Exactly Happened On The Night Of His Death! Next articleWHOA! Baba Ramdev To Make His Bollywood Debut With This Film?